The Azure Quickstart Templates are a great resource for getting started with template based deployments for many different technologies, including Elasticsearch. Just recently we made some improvements to the Elasticsearch template that enable you to create a pre-configured Elasticsearch cluster which stores data on Azure File storage, and provides you with the option of installing plugins like Sense, Marvel and Kibana, all in just a few minutes. If you are not familiar with Azure Files, this service offers shared storage using the SMB protocol via mounted shares. This storage is accessible in the same region to any number of virtual machines or roles, and is supported in both Windows and Linux. For more information, take a look at this introduction to Azure File storage. 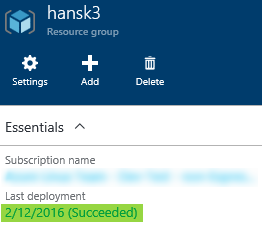 Trying out this new functionality is trivial with the improved Azure Resource Manager template. In this article we will go through a simple example to get you up and running with Elasticsearch on Azure File storage. After selecting Deploy to Azure in the Elasticsearch template, you will need to provide some parameters to the deployment. If unsure, use the default values to get started. Some of the parameters are explained in more detail below. Once the deployment is complete, you can find the Kibana URL and Jumpbox IP in the deployment outputs for the specified resource group in the Azure portal. Select the resource group, then the Last deployment link under Essentials to find the Kibana and Jumpbox deployment outputs. Simply use the right-hand buttons to copy the Kibana URL to the clipboard and paste it into a browser window to bring up Kibana. 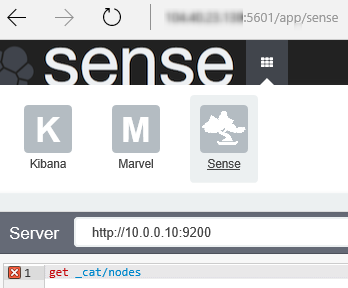 Provided the Sense option was selected at deployment time, you will be able to switch to the Sense app via the Kibana interface. In order to execute Sense commands, the correct IP will need to be set. The master nodes use static IPs, so replace localhost with 10.0.0.10, or any other private IP from the cluster, which can be found under the list of resources in the portal. With these settings, the index will be created in the correct location (under the shared data path), and the index will have shadow replicas. The setting to recover a shard on any node is important, as it instructs Elasticsearch to not wait for a node to rejoin the cluster before recovering its shards from the shared filesystem. You can find more information about shadow replicas in the Elasticsearch documentation. In this article you saw how to quickly and easily deploy a fully pre-configured Elasticsearch cluster, including optional tools like Marvel, Sense and Kibana. 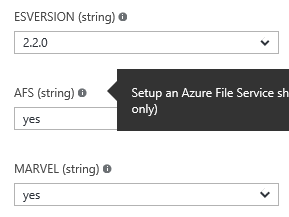 You also learned how to access this cluster and create a shadow replica based index on the shared storage provided by Azure Files. In order to move from the Development phase into Production deployments, you might be interested in the following topics. In addition, we are working closely with the Elastic team on providing the tools and guidance for Elasticsearch at scale on Azure File storage. We will be publishing more information about this in the near future, so stay tuned!